Some people understands the meaning of this name as Teacher Aptitude test. That means the short form of it is (TAT – Teacher Aptitude Test). But if you read or understands it as Teacher eligibility test then you would write it as (TET – Teacher Eligibility Test). 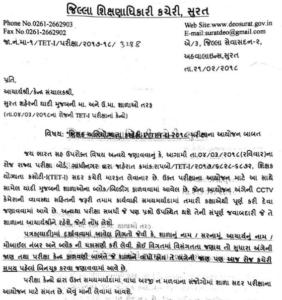 State Examination Board Conducting Both Level of Examination (Tet / TAT) by official sites ojas.gujarat.gov.in (OJAS). Gujarat TET and TAT Online Application available only Ojas Online job Application System. New TET 1 Exam date Is published by GSEB. New Exam Date is 4-03-2018 (4th March 2018). Previous Exam Date was 31st December which was cancelled Due to some reasons. The GSEB is the board under the government of Gujarat that conducts the 12thSTD exams and also the entrances for the technical institutes in the state. The board is also responsible for conducting the primary and the secondary teacher’s recruitment by the Teachers Eligibility test exam. 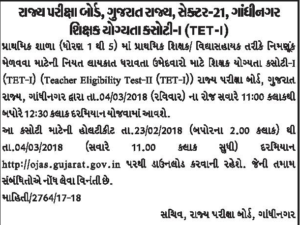 Updates : TET exam Time Changed. See Notification at below. The GSEB is the board under the government of Gujarat that conducts the SSC / HSC exams and also the entrances for the technical institutes in the state. The board is also responsible for conducting the primary and the secondary teacher’s recruitment by the Teachers Eligibility test (TET) exam and Teacher Aptitude Test (TAT). All Information regarding both level examination e.g. Application date, exam date, eligibility, syllabus and the procedures to apply for the exam, Call Letter, Selection List, Merit List, Result, Document Verification Programes are given under the subheadings that follow. Teacher Eligibility Test (TET) and Teacher Aptitude Test (TAT) Both Examination will be conducting of MCQ type Question Paper with Series A, B, C, D, E, F. TET 1 (150 Question) Duration of 90 Min. MCQ means Objective Type Question & Answer, All Question with 4 Option Answer, Select Any One Answer Compulsory. The syllabus of the TET-1 exam tests on the Basic English, science, mathematics and social science. The various topics which are to be covered under each subject are given in detail in the website SEB Official website. General Category Examiners Pay Rs. 350/- As a Registration Fees. Examiners, Please Visit The Official Website To Get More Information About The TET 1 Age Limit. · First to Candidates Visit The OJAS Website https://ojas.gujarat.gov.in/. · Then Go To The Call Letter Tab right side. · Then Enter Your Confirmation Number And Birth Date. · Enter Call Letter Button. · View or Download Call Letter Button. · At That Time Your Call Letter Appear In Your Desktop Screen. · Check Your Name, Exam Date, And Center Properly of Your Call Letter. · Take Print Out TET 1 Call Letter For Future Use. The Tet 1 exam application date, exam date, eligibility, syllabus and the procedures to apply for the exam are given under the subheadings that follow. 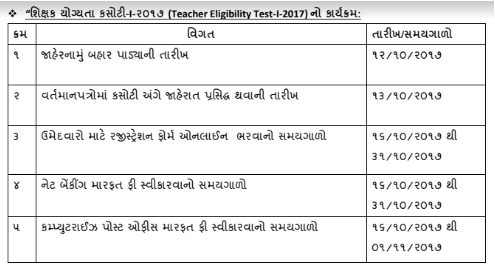 The Gujarat Tet exam date 2017 is given in the advertisement and also put up in all kinds of media like newspapers, government magazines, radio etc. For the awareness of the candidates and there is also a pdf file attached in the vernacular language itself to cater their needs even better. Under the link which says TeT 1 / Primary school teacher recruitment, if one makes a click, he/she will be directed to a new webpage. One has also got provisions to choose the medium of language for application. The new webpage has the notification and also the official advertisement which was released by the gseb.org. One must read the notification clearly and carefully to see if they fit themselves into all the terms and conditions. The notification carries details like Education Qualification, Age limits and other details. If the person can verify for oneself that they are eligible for the mentioned post, then they have to click on the Apply tab on the webpage. Thus, the process to apply, age limit, educational qualifications, syllabus for the OJAS TeT 1 exam is discussed in detail and that helps the aspirants with the preparation. Know more about tet on SEB Website.